The contribution COEXISTENCE approaches the project Solana Ulcinj in two different ways. 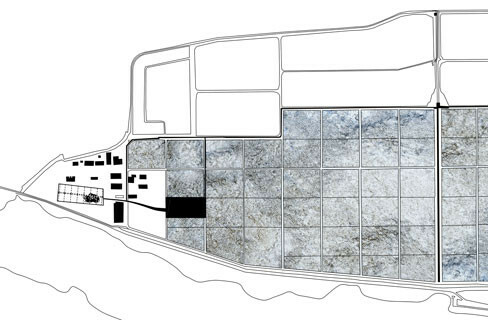 The projected part of the exhibited work tries to raise awareness for the particularity of the site Solana Ulcinj. 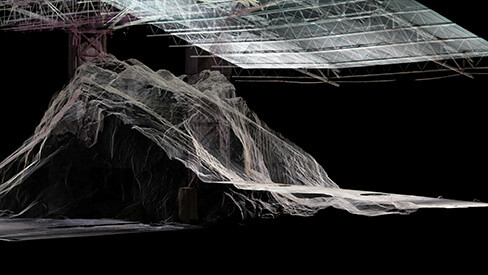 An animation of a transforming point cloud shows the transcendence of this landscape structure and facilities. 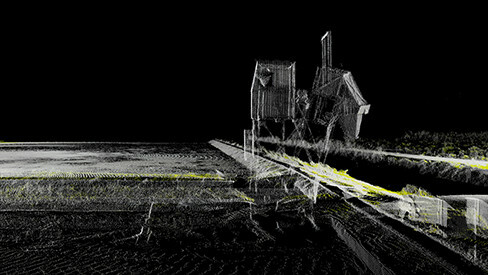 The footage of the movie is based on a 3D laser scan of the entire landscape. 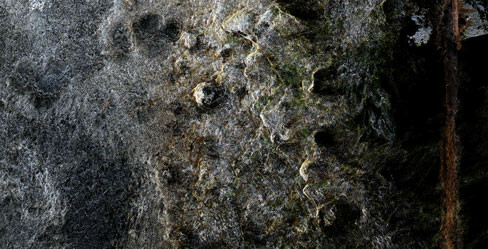 By descriping the landscape with a point cloud natural and artificial elements appear with the same coding and thus the boundaries between nature and artifice are constantly blurred. The second part of the project shows a sectional model which illustrates an architectural and spatial concept. This architecture with the program of a museum for contemporary art and nature should, on the one hand, utilize its role as an attractor to improve the region economically; on the other hand, it should be a space of contemplation in the context of environmental topics. We’re venturing elsewhere without ever having made a step in this direction and we’re diving into an unknown dimension made of noise that turns into a visual experience. A multitude of points, point by point, once slacked and once ranked, scattered in the vastness, a synchronized generation of compression and resolution into thousandfold. All these elements are visualizing a landscape in which well-known forms of accumulation are converging into a geometry of new structures. If the virtual is handled as a pure fiction, a phantasm or a ghost, the virtual appears as something not concrete. It appears as a mysterious entity, something abstract beyond the concreteness of experienced realm. However if virtuality is handled as a strategy of communication, the virtual room appears as the expansion of being and at least as the expansion of the concrete - then what is virtual is the real that just as yet unrealized. Playing and experimenting with virtual rooms is at least an expression of a primordial and intimate human instinct. It is an instinct that motivates us to design utopias managing the future as a realizable occurrence of the contemporary. Utopias and virtuality aren’t non-places or fictional spaces but forces of exploration. The virtual room is a speculative room. It is the poetic ability to take a glance from the future to our past and realizing that these past is now. 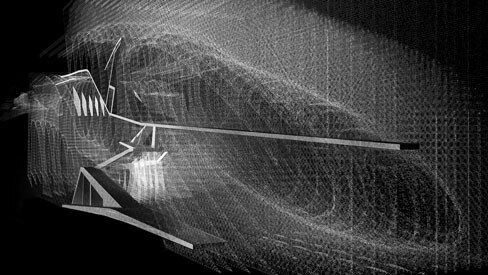 The morphology of the point-cloud is agglomeration of algorithms. 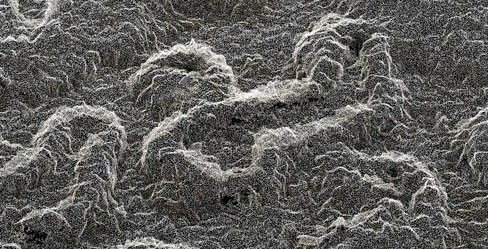 The point-cloud is a medium of information, legibility and narration. The point-cloud is also a paradigm for coexistence in which the gradually sized takes place at the same time as their own possibility without interference of one element from another. Coexistence implies the simultaneous occurrence and presence of different elements, such as creature, species and systems at a specific location. This concept shows, how existence and topos belong together and are mutually dependent. Both elements are inevitably linked to a spatio-temporal dimension. Everything that exists has a duration and is due to its presence both a spatial intervention and expansion. However the term “coexistence” means a particular form of existence. Coexistence is the form of existence in which multiplicity becomes one unit and where the individual has no territorial claim towards the collective. If a place is characterized by coexistence it is not a territory anymore. The Solana Ulcinj is not a territory, it is a landscape which is characterized by coexistence and diversity. The biodiversity of the Solana is the result of a converting process. Environmental change is determined by specific social, cultural, political or economic conditions and the institutions that accompany them. Process of socio-environmental metabolic circulations transform both social and physical environments and produce social and physical milieus with new and distinctive qualities. Solana Ulcinj is a place of narrations. It is a narration of an area and its related fates. For this, Solana Ulcinj is not only a singular space but a symbol for other places worldwide with a similar story and reveals at the same time the entanglement of the global into the local. 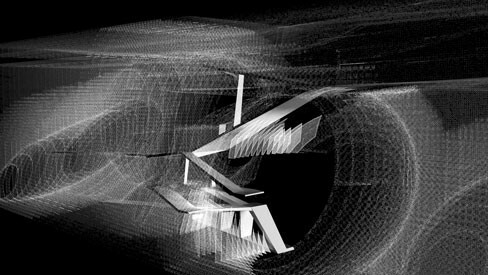 This antiterritorial and virtual experiment would give new inputs for new ways of abstraction. In that sense the Solana Ulcinj is an example of the blurring boundary between the natural and the artificial and it emphasises the landscape as a composition of nature elements and as a socio - cultural idea. It invites us to perceive the qualities of this unified structure within which the coexistence of natural and artificial systems created a specific environment. The Solana Ulcinj is a narrative interrelation between utopia and tragedy, between reality and fiction that encourages its exploration.